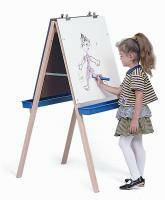 & WRITE/WIPE BOARDS has heavy-duty hinges on sturdy hardwood legs. Two clips on each side hold paper firmly. Height adjusts for children ages three and up. Comes with one Write and Wipe board and one chalkboard. 24" x 24". 21 lbs. FED EX or UPS Ground. GreenGuard certified. Made in USA. Dimensions: 24in. × 24in. × 48in.